Traditional foods can bring us an understanding of history and geography. Take pupusas, a popular Salvadoran dish we enjoyed at lunch at the home of Pedro and Sasha Quintanilla recently. These thick, handmade corn tortillas have a pedigree that dates back thousands of years. The Pipil tribes, who inhabited the area that is now known as El Salvador, are said to be the originators of the dish, although Hondurans have argued that pupusas began with the Nahuans. At Joya de Ceren in El Salvador, a UNESCO World Heritage archeological site, often referred to as the Pompeii of the Americas, cooking implements for the preparation of pupusas were found at the site of a native village that was buried in volcanic ashes around AD 600. The Quintanillas with Senei Posada. Senei is holding yucca, Sasha is holding empanadas and Pedro is holding Lucas. Pupusas remained a localized dish in several towns and cities in El Salvador but as the population began moving to other areas in the 1960s, pupusa stands cropped up throughout El Salvador and then in other countries. 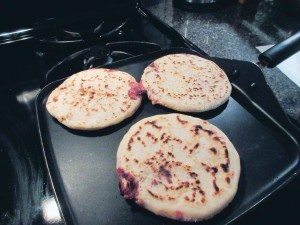 With the migration of Salvadorans during their Civil War in the 1980s, pupusas came to the United States with the refugees. It was during that time that 13-year-old Pedro came to the United States settling on Long Island with his family. He attended local schools, eventually studying for a business administration degree at SUNY Old Westbury. There he met Sasha, born in the U.S. to a mother from El Salvador and father from Ecuador, who was also a business major. They married and in 1990 moved to Westbury where they are raising their two children Olivia and Lucas. 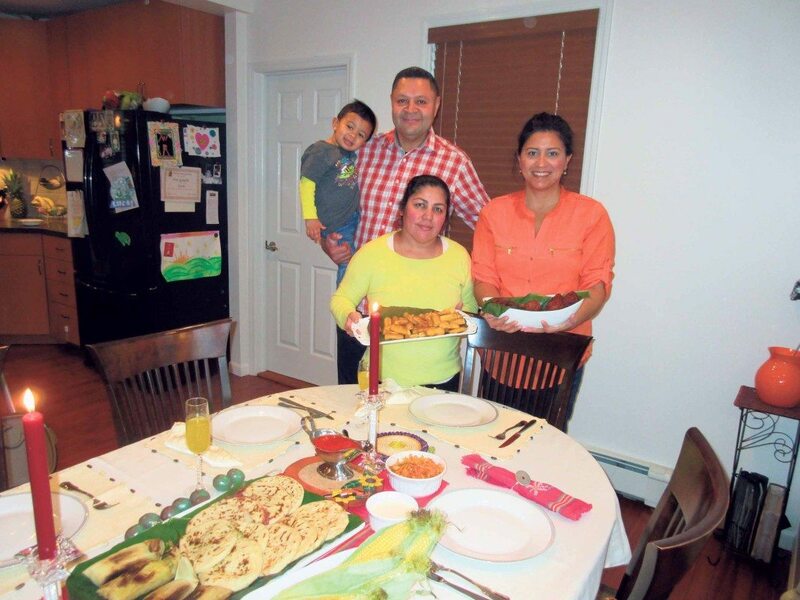 Acknowledging that the preparation of pupusa requires an expert hand, the Quintanillas brought in a family friend, Senei Posada, to do the cooking. Senei prepared the pupusas in the typical manner, on a smooth flat griddle, not fried, with three different fillings: cheese and refried beans; chicharró (finely shredded and cooked seasoned pork that is combined with onions, peppers and tomatoes); and cheese with loroco (a vine flower bud). The pupusas were served with the side dish of lightly fermented cabbage slaw with red chilies and vinegar called curtido. Also on the table was fried yucca with a tomato sauce, tamales and Salvadoran style empanadas de platano. These sugar-coated empanadas made with plantains are a Salvadoran staple. In the version at the Quintanilla home, mashed plantains were turned into a delicious outer dough and stuffed the pockets with refried beans for a savory/sweet version. In 2004, during the Dominican Republic-Central America Free Trade Agreement negotiations, Honduras gave up its claim to be the sole exporter of pupusas, ceding victory to El Salvador, and the next year the Salvadoran Legislative Assembly declared pupusas as the nation dish. Every second Sunday of November pupusas are celebrated with fairs throughout the country. Perhaps as a school board member Pedro can bring National Pupusa Day to Westbury. 1 can (16 oz.) GOYA Refried Red Beans (Volteados Style) or your own refried beans. Can also use any soft cheese or custard filling instead of refried beans. 1. Cut each plantain into four equal parts including skin. In saucepan, bring water and salt to boil, add plantain and cook until soft, about 10 minutes. Drain. 2. Peel plantain; discard skin. Mash plantain until smooth using food processor or hand masher. 3. Put about 3 tbsp. of mashed plantain between two pieces of plastic wrap. Use a rolling pin and/or your hands to shape the plantain dough and make a 4 ½ inch circle about ¼ inch thick. Put 1 ½ tbsp. of refried beans onto the dough and, using plastic wrap to lift, fold it over to form a half. Using your fingers, seal the edge of empanada. Repeat using all the plantain mixture. You should have about six empanadas. 4. In shallow bowl, combine sugar and cinnamon. Set aside. 5. In skillet, heat ½ inch oil on medium. Oil should be hot, but not smoking, about 350° F. Fry the empanadas until lightly browned on both sides. Drain on paper towels. 6. While still warm, dredge empanadas in sugar to coat on both sides. Serve warm.